Elizabeth Littlefield, President and CEO of the Overseas Private Investment Corporation (OPIC), discusses the development finance institution’s innovative work to support and advance impact investing. Bertrand Gacon, Head of Impact Investing and Socially Responsible Investing (SRI) at Lombard Odier, discusses the recent launch of the bank’s first impact investing fund of funds. 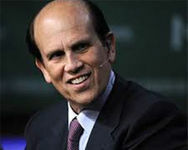 Financier and philanthropist Michael Milken shares his perspective with the GIIN community. Nick O’Donohoe, CEO of Big Society Capital (BSC), an independent financial institution established in 2012 to develop and shape a sustainable social investment market in the UK, shares his perspective with the GIIN community. Vishal Mehta, Co-founder of Lok Capital, an Indian venture capital firm that invests in enterprises serving the lower income and base of the economic pyramid population segments, shares his perspective with the GIIN community. After an April launch of its Investing with Impact platform, Audrey Choi, Managing Director and Head of Global Sustainable Finance at Morgan Stanley, discusses the organization's work in impact investing. On the heels of a decision by the Rockefeller Foundation's Board of Trustees to extend this initiative, Dr. Judith Rodin discusses the Foundation's upcoming work in impact investing. Luis Alberto Moreno, President of the Inter-American Development Bank Group, shares his perspective with the GIIN community. Barbara VanScoy, Founder, Chair of the Board, and Senior Portfolio Manager at Community Capital Management, shares her perspective with the GIIN community.